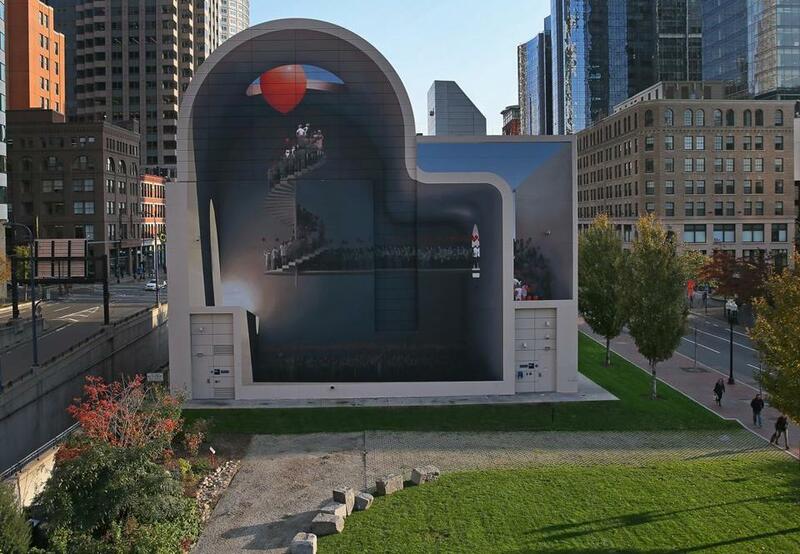 Mehdi Ghadyanloo’s mural “Spaces of Hope” on the Rose Fitzgerald Kennedy Greenway. You can see it as you emerge from South Station. You can see it from certain city office windows. You can see it from a deck chair on the lawn at Dewey Square Park. But perhaps the most dramatic vantage point from which to see the brilliant new Dewey Square mural by Iran’s Mehdi Ghadyanloo is your car as you come out of the tunnel at the South Station exit off I-93 South. You have to crane your neck, and a concrete wall blocks part of the view. 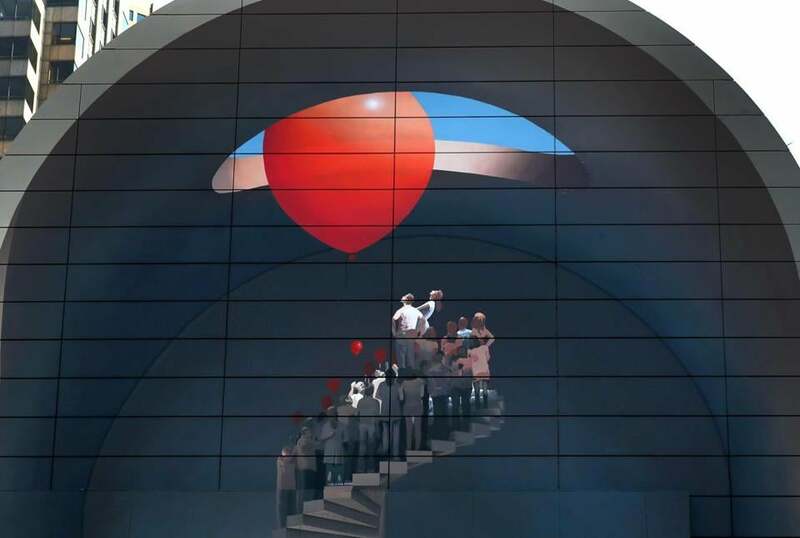 But the mural, which shows a crowd of gray office types ascending a spiral staircase toward a circular opening in a ceiling, somehow echoes your own emergence from the tunnel. There’s something about coming out of darkness into a sunlit realm and glimpsing those other figures, in the mural, doing the same that shifts gears in your soul. A detail of the mural on in Dewey Square. This latest mural — the fifth in a sequence of temporary murals commissioned by the Rose Fitzgerald Kennedy Greenway Conservancy — is unlike any of its predecessors. Ghadyanloo’s work is not abstract. It’s not text-based. It’s not inspired by graffiti art. Rather, it’s a giant trompe l’oeil image — part Rene Magritte, part Banksy — that’s open-ended, richly meditative, and cunningly keyed to its context. Ghadyanloo grew up on a farm in Iran during that country’s devastating, drawn-out conflict with Iraq. His mother was a carpet weaver, his father a farmer. The war, which left profound scars on his entire country, imprinted itself on his psyche. Tehran, a teeming city of well over 10 million, has vast numbers of blank walls on boxy, modernist buildings. Many still carry anti-American propaganda. But times are changing. Tehran’s contemporary art scene, which is far livelier than in most big American cities, is flourishing. And there’s a hunger for public art that reflects some of the changing attitudes of the city’s inhabitants. So when, in 2006, the Municipality of Tehran’s Beautification Bureau launched a call for more murals, Ghadyanloo answered it. He and his team of Blue Sky Painters have since painted more than 100 murals in the Iranian capital. More recently, they have accepted prestigious commissions in London and, now, Boston. Ghadyanloo has been called “the Banksy of Tehran.” But that’s not quite right: Banksy influenced him, but his paintings, in Tehran and elsewhere, are not guerilla operations — they’re officially approved commissions — and he’s not anonymous. But, like the works of Banksy, his murals have wound their way into the imaginations of millions. In a society that still exerts strict control over images, it’s presumably not easy to make powerful public murals that will also be palatable to the authorities. Ghadyanloo has had as many proposed murals rejected as accepted. Many of his paintings appear whimsical (a giraffe in an apartment block, flying cars). But they also have a bewildered, mournful edge, a base note of dismay. A detail of the mural by Mehdi Ghadyanloo. The new Dewey Square mural, wanly titled “Spaces of Hope,” seems a triumph to me. 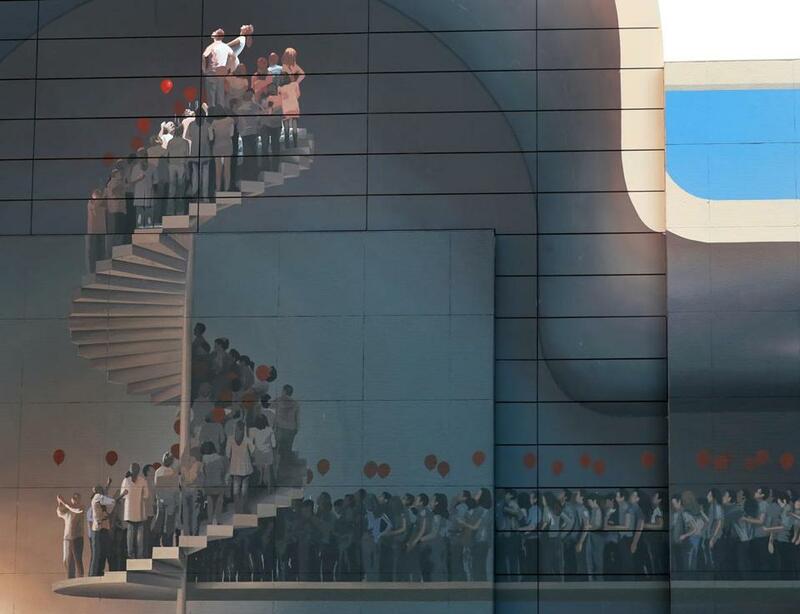 A crowd of men and women, many holding red helium balloons (a recurring motif in Ghadyanloo’s work) waits in line at the base of a cavernous interior space, which we see in cutaway. The line disappears out a door to the right, only to reappear again in a narrow passage open to the sky. The waiting figures then cross another threshold back inside and continue along a raised platform that leads to the spiral staircase. Up they parade toward a circular opening in the dome, pursuing a giant red balloon that has already half-escaped. They are chasing something bright and hopeful. But they seem suspended, too, in a kind of limbo, practicing patience. The whole thing appears simple. But Ghadyanloo’s control of spatial illusion is masterful. He transforms the flat windowless wall into the cutaway interior of a dome with effortless aplomb, cleverly matching the design of his image to the unusual shape of the wall, with its off-kilter, semi-circular top. Note the light source at bottom left. You may not register it at first, because the eye is drawn up to the opening and the balloon. But the way it spreads across the interior helps carve out the illusion of three-dimensional space. Note, too, the brilliant interplay between inside and outside, activated by the movement of people between one and the other. And marvel, most of all, at Ghadyanloo’s use of blue, both in the opening in the dome and in the patch of sky to the right. It makes the whole image, and the building itself, appear at once real and porous. These are all optical tricks you can learn. They’re not magic. But Ghadyanloo, who has evidently had lots of practice, is very good at making them interact with the urban landscape around him. In doing so, he makes surprise, mystery, and an excruciating strain of melancholy available to all of us. If, that is, we want a piece of it. 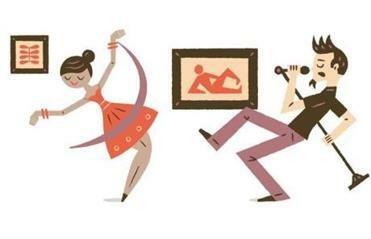 By Mehdi Ghadyanloo. At Dewey Square Park, Boston.